In the events and remembrances surrounding Palm Sunday and Easter, Christians and the church easily forget a small fact that changes the complexion of these two beautiful and historic stories: Jesus was and is Jewish. Raised as an observant Jewish boy, he grew up cleaving to the underpinning of his roots culturally, linguistically, and religiously. If we had a sample of Jesus blood today and submitted it to the scientific labs at ancestor.com — one of the famous high-tech operations available to the public — it would be discovered that His DNA code would be completely Middle Eastern Jewish. But more importantly, the Son of God and Man who came riding in on a donkey had a Jewish world viewpoint and heart. His every thought and action were rooted in the Torah and the Law. And as we see as Jesus neared the day of crucifixion on a cruel cross, His action and response to God His Father remained malleable to higher purposes. It was Jesus’ Jewish heart that longed to please the One who sent Him to earth in the first place. 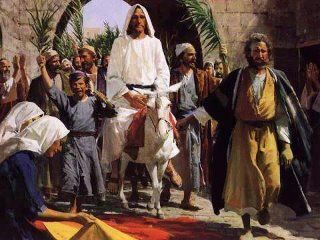 On Palm Sunday Jesus rode into the streets of Jerusalem on a donkey. The people knew Him and received Him as their Jewish king, throwing their garments down and waving palm fronds to glorify their king. But as they cried “Hosanna, glory to God in the highest,” they saw Jesus as a warlord upon a warhorse who would conquer their Roman oppressors. And only days later, the same people who chanted, “Hosanna,” screamed for him to be killed and demanded the release of a Barabas, as murderer. How fickle humankind is, bending to the whims of emotion. Rejoice greatly, O Daughter of Zion! Shout, Daughter of Jerusalem! See, your king comes to you, righteous and having salvation, gentle and riding on a donkey, on a colt, the foal of a donkey. I will take away the chariots from Ephraim and the war-horses from Jerusalem, and the battle bow will be broken. He will proclaim peace to the nations. His rule will extend from sea to sea and from the River to the ends of the earth (Zach. 9:9-10). In retrospect and historically, the followers of Jesus would recognize the donkey as a symbol of humility — an echo from His ignoble birth. Mary, His mother, who rode on a donkey to be taxed, great with child, and delivered the baby in a stable. This was such an ironic way for a king to be born. Jesus came to bring peace alright, but not peace through strength — rather peace through love and forgiveness. These two words were the very foundation and essence of his life and work on earth, as Jesus admonished his disciples to “love the Lord God with all their strength and mind and your neighbor as yourself” and to know that God would not forgive their sins unless they forgive the sins of others. Simple truth and yet profound, earth and heaven shattering truths that changed the world forever. But there may be a messianic, prophetic connection with the choice of a donkey as well. We see in the Old Testament passage below that it was appropriate for a Jewish would-be king to ride on a donkey. It was one way to make it apparent for others to recognize his kingship. “Call to me Bathsheba.” And when she was come in to the king, and stood before him, The king swore, and said: “As the Lord liveth, who hath delivered my soul out of all distress, Even as I swore to thee, by the Lord, the God of Israel, saying: Solomon thy son, shall reign after me, and he shall sit upon my throne in my stead, so will I do this day.” And Bathsheba, bowing with her face to the earth, worshiped the king, saying: “May my lord David live for ever.” King David also said: “Call me Zadok, the priest, and Nathan, the prophet, and Benaiah, the son of Joiada. And when they were come in before the king, He said to them: Take with you the servants of your lord, and set my son Solomon upon my mule: and bring him to Gihon: And let Zadok, the priest, and Nathan, the prophet, anoint him there king over Israel: and you shall sound the trumpet, and shall say: ‘God save king Solomon.’ And you shall come up after him, and he shall come, and shall sit upon my throne, and he shall reign in my stead: and I will appoint him to be ruler over Israel, and over Judah” (1 Kings 1:28-35). During the reign of King David, the people desired Adonijah to reign when David died, but that was not the hope of the king. David wanted Solomon, so a mule or donkey was chosen from King David’s own stables. Solomon rode through the city for all to see that he was David’s choice to take the throne. And the people then rejected Adonijah and crowned Solomon eventually. And someday God’s choice will reign as king and lord of the whole earth, over every nation from his throne on Jerusalem. I can only say, Hosanna in the highest. Glory to God in the highest! : with the throngs. At that time, His own will mourn Him whom they pierced. I will pour out on the house of David and on the inhabitants of Jerusalem, [a]the Spirit of grace and of supplication, so that they will look on Me whom they have pierced; and they will mourn for Him, as one mourns for an only son, and they will weep bitterly over Him like the bitter weeping over a firstborn (Zech 12:19). Reblogged this on hammered gold. Please add me to your blog list.